Two weeks ago I mentioned a technique we had developed for controlling Canada goldenrod. 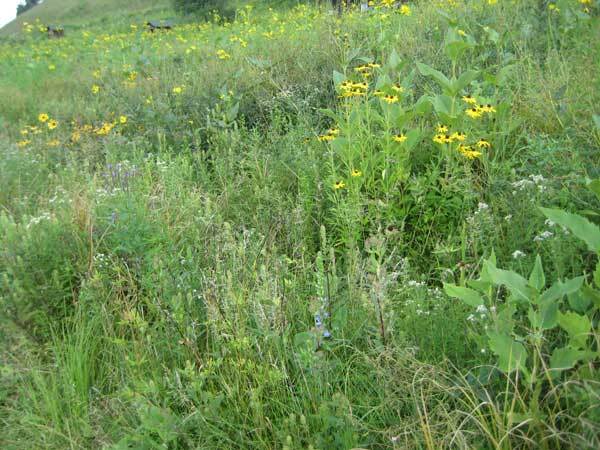 This invasive native is often a problem in prairie restoration. Since it is clonal, it often forms fairly large patches, and grows so densely that other "good" species can't get a foothold. As I wrote, most of our Canada goldenrod patches are primarily along the edges of the prairies, and hence are relatively small. The leaf spritz technique we use is ideal under these conditions, since it permits very selective treatment of the goldenrod without affecting adjacent plants that are even fairly close. We use a 20% mixture of triclopyr (Garlon 4) in bark oil, dispensed with a hand-held spray bottle. A few leaves on the upper part of each stem in the clone are given a brief "spritz". The few leaves spritzed are high enough on the stem so that no stooping is needed. The photos here show what a plant that was in full flower bud looks like after about 2 weeks. 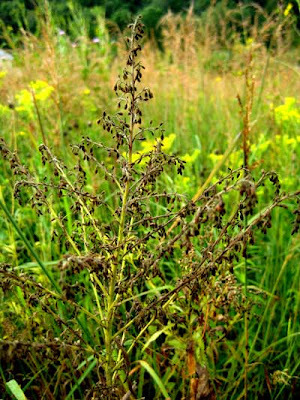 The adjacent untreated plants are completely unaffected. I admit that this is a relatively slow technique, since one has to deal with each stem individually. However, this has the advantage that nearby good plants are unaffected. Marci and I were able to treat about a dozen reasonably large clones (15-30 stems each) in less than an hour. 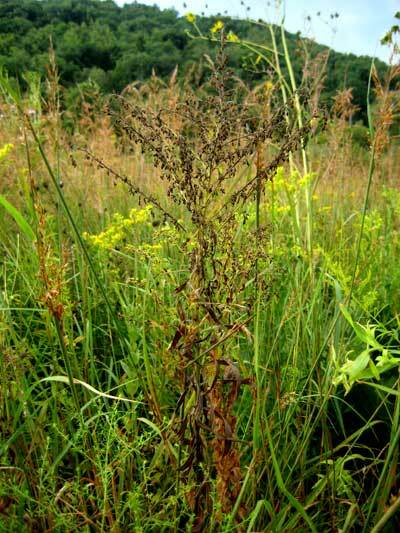 As in most invasive plant control, the best time to initiate attack is when the problem is still small. Now is a very good time to do this, since Canada goldenrod is in flower and hence easy to find. If all the stems in a clone are treated, you get rid of the clone for good. Last year when I first used this technique, I marked some treated clones and found no new growth this year. 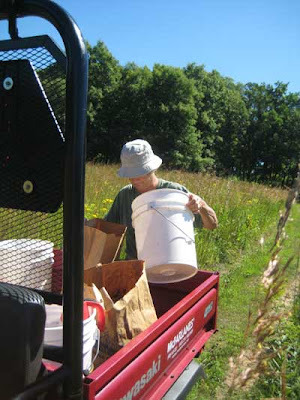 When the seeds are ready, white prairie clover is fairly easy to collect. One simply grabs three or four stems and strips the seeds directly into a bucket. 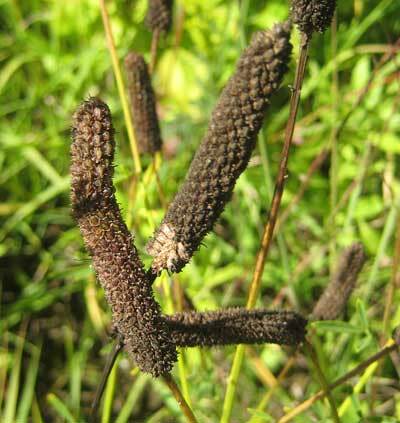 Even though these plants are short and buried among (at this time of year) tall Indian grass, they are easy to find because of the large cluster of stems. Purple prairie clover can be collected in the same way, although this species has smaller flower and seed heads, so the yield is lots less. The fruit is a thin-walled pod which contains a single (or rarely two) seeds. Each seed is kidney shaped. The spiral pattern of the pods can be seen in the photo. Kathie and I spent about an hour collecting this species and then pooled our harvest. We got a lot of seed! Most of the prairies at Pleasant Valley Conservancy are small (less than 5 acres), which means that they have lots of edges. Anyone doing prairie restoration will tell you that edges are bad, since they increase chances for weed invasion, and have significant negative effects on wildlife. However, you play the hand you've been dealt, so at Pleasant Valley Conservancy we are learning how to cope. 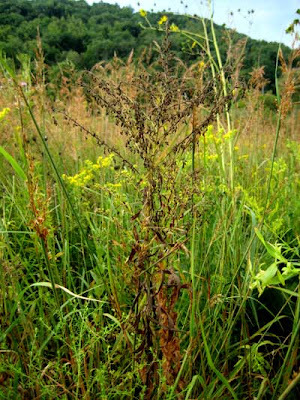 This week Marci and I spent part of the day in the Barn and Cabin Prairies killing Canada goldenrod (Solidago canadensis), one of our most persistent (albeit native) invaders. This is the time of year to deal with this species, since it is just starting to flower, making it easy to recognize. At first glance, it looked like we had a pretty serious infestation, but once we got into it we realized that all the Canada goldenrod was along the edges. Once we pushed past this tall fringe, we got into a much more diverse prairie, with lots of shorter species. It is not only the weedy invaders that line the edges. Several of our small prairies have fringes of tall prairie species, such as the Silphiums. It is not difficult to understand the ecology here. For one thing, plants growing along an edge don't have to deal with competition from that side. Also, they get more favorable light, so they can grow taller. We used the leaf spritz technique on the Canada goldenrod. This is a procedure that worked well in last year's tests so we are expanding its use. Two or three leaves on each goldenrod stem are gently sprayed (just a few drops) with 20% Garlon 4 in bark oil. Within a day or two the sprayed stem starts to twist, and within a week it is turning brown. In two weeks it is completely dead. In my tests I had found that if all the stems in a clone are spritzed, the complete clone was killed, and the eradication was permanent. The nice thing about this technique is that it is very quick and easy, and if one is careful there is no damage to "good" plants nearby. This procedure is slower than mowing but lots less disruptive to the prairie, and if done properly eradicates the whole clone (which mowing does not do). 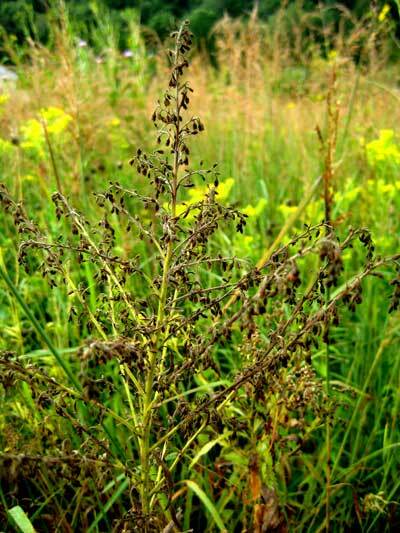 In a post two years ago, I showed that lousewort (Pedicularis lanceolata), a hemiparasitic plant, was infecting the sedge Carex trichocarpa and holding it in check. This sedge forms monospecific stands that are so dense that other species are not able to grow. Although it may be better to have the sedge than reed canary grass (another possibility in our wetland), it certainly reduces species diversity, as the upper photo shows. 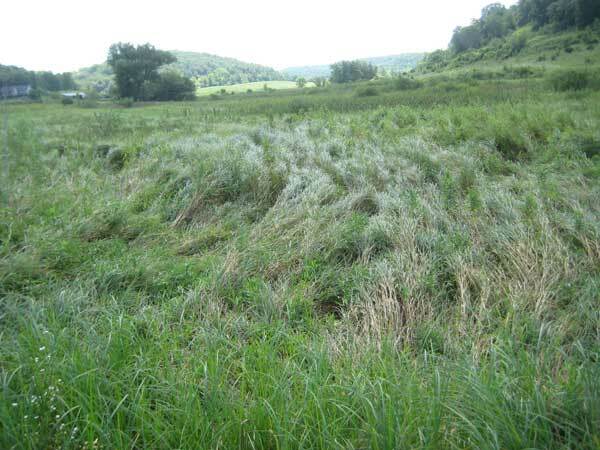 This year this sedge-lousewort system has advanced and several other wetland species have now become established in areas that formerly had only sedge. The lower photo shows the result. Quite a contrast. 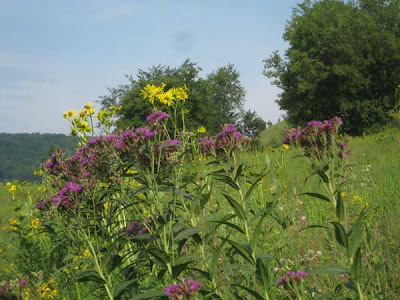 Species now present are cup plant, golden glow (Rudbeckia laciniata), mountain mint, blue vervain, and great blue lobelia. The role of wood betony (Pedicularis canadensis) in increasing diversity in prairies has been well established, so it is not surprising that lousewort can have the same effect. 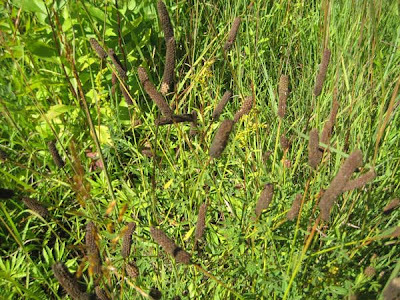 These hemiparastic plants have been called "keystone" species, whose very presence contributes to the diversity of life. In prairie ecology wood betony keeps grasses in check, thus increasing the possibility for establishment of forbs. It now appears that lousewort can play the same role in wetland ecology. 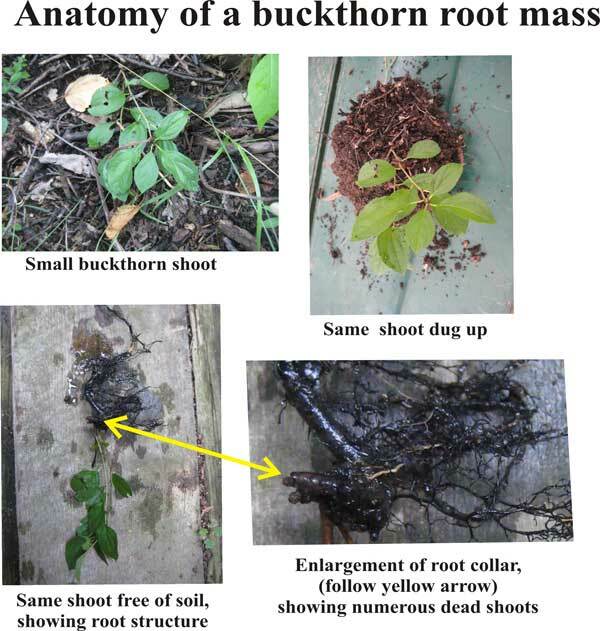 My interest in buckthorn growth and survival continues. Eventually this knowledge should lead to better understanding of how to eradicate this exceedingly undesirable plant. At Pleasant Valley Conservancy I have been following buckthorn growth in one small test area for the past dozen years. The big plants were cut and treated or basal barked (both with Garlon) in 1999-2000. The area has been burned annually ever since. Buckthorn shoots have continued to arise each year. Where are these shoots coming from? The seed bank had been long exhausted. Were they shoots that had been missed in previous years, or were they new growth from underground stems or roots? To attempt to get a handle on this problem, last year I very carefully killed every visible buckthorn shoot in this test area. I made sure there were no visible buckthorn plants by returning every few weeks to kill any new shoots that might have arisen. At the end of the growing season in October, I did a final canvas to make sure there were no living buckthorn plants visible. At the end of July this year I did another survey of this same area. Imagine my surprise to discover 71 small buckthorn plants! Where are they coming from? I dug one of these plants and carefully cleaned all the soil off. The photos below show the result. Despite the fact that this was a fairly small shoot, it was attached to a surprisingly large root mass. The root itself, and the root collar, was thick and woody. Further, arising from the root collar were thirteen shoots, each of which must have been part of some previous year's growth. Remember, the site has been burned each spring. My interpretation is that this and the 70 other plants I found, have arisen from dormant root masses, which remained lurking underground waiting for favorable growth conditions. It looks to me that without some heroic measures, eradication of buckthorn seems pretty unlikely. Areas cleared of buckthorn must be followed up in future years, and new shoots treated with herbicide. This must continue until all the underground dormant root masses are gone. Fortunately, not all sites at Pleasant Valley Conservancy have such a large storehouse of dormant root masses. Many of our sites are now in fairly good shape, although almost every such site has to be canvassed in early summer for small buckthorn plants that need to be herbicided. 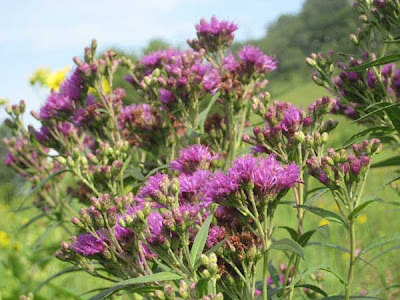 Ironweed (Vernonia fasciculata) is now in full bloom in our wet-mesic prairies (Barn Prairie, Valley Prairie). This is a species with an intense and distinctive color. 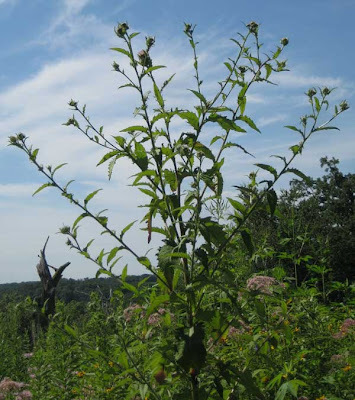 It is apparently common in southern and western Wisconsin, although according to the USDA plant index it is absent from most of eastern United States. What is a wet-mesic species doing up there on the south slope? I assume that there is ground water seepage in this dolomite layer, making conditions favorable for ironweed. Seems reasonable, since there is also a native population of Culver's root (Veronicastrum virginicum), another wet-mesic species, growing on this same dolomite shelf. I am fascinated by these micro-habitats. This same dolomite shelf was also home to a substantial population of sweet clover that we have now mostly eradicated. For some years we have been trying to get woodland thistle (Cirsium altissimum) established in our savannas, and we are finally having some success. This biennial is the tallest native thistle (hence its Latin name), its height often exceeding 8 feet. 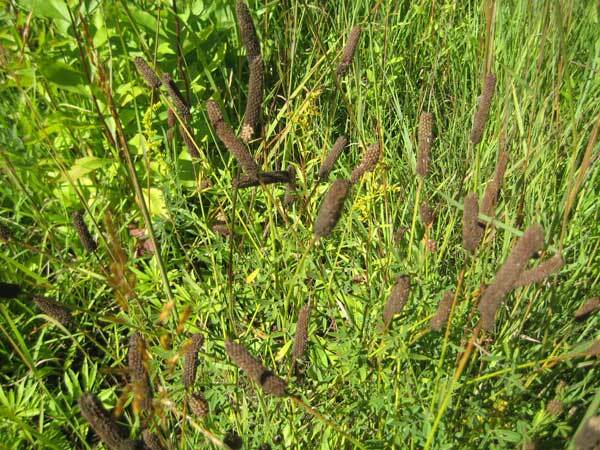 We started by throwing seeds out in some of our savanna areas, but never saw any plants. We then turned to greenhouse-grown plants which we transplanted. It grows vigorously in the greenhouse and transplants well. Most of the plants we set out grew as rosettes the first year and then flowered and set seed the next year. However, since they aren't perennial, once they flower they are gone. 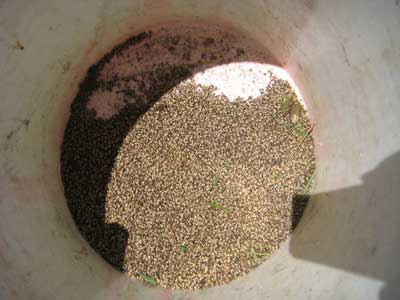 To get an established population, one needs continuous production of viable seed. It seems now that we are finally getting this species established, as we are seeing more plants scattered throughout, even in areas where we had not set out transplants. Although this species is found throughout eastern United States, in Wisconsin it seems to be found only in the southern part of the state (per UW Herbarium records). It has a C value of 6.